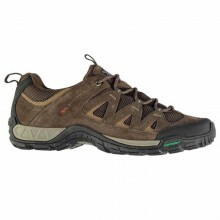 The Karrimor Hot Rock Mens Walking Boots are formed with a stitched suede upper with Weathertite Ext.. This tough and durable alloy drinks bottle is perfect for staying hydrated during your out..
Stay stylish with the Karrimor Aspen Technical T Shirt which benefits from classic short sleeves and..
Keep your valuables safe in this Karrimor belt designed with two zipped pockets to the fro.. This Karrimor Cobra Cap is constructed with light weight breathable fabric to assist in keeping you .. The Karrimor Microfleece is a year-round wardrobe essential that’s great for wearing under a w.. The Karrimor T2 Xlite Zip Top features engineered mesh panels throughout with a quarter zipped neck ..